Apa yang Anda lihat di sini adalah bentuk baru "fotografi inframerah" menggunakan "near infrared" spektrum cahaya. Anda mungkin telah mendengar tentang teknologi baru yang kontroversial ini di berita akhir-akhir ini! Dalam upaya untuk mencegah orang mengambil menyelinap melihat-meskipun snapshot atlet perempuan menggunakan inframerah fotografi, sebuah produsen peralatan olahraga di sini telah mengembangkan celana dalam yang menghalangi sinar infra merah. Celana ini diproduksi oleh Cramer Jepang. Presiden perusahaan, Takashi Hokazono, mengatakan ia berharap hal itu akan membantu atlet merasa lebih nyaman. "Ini mungkin akan membebaskan mereka dari rasa takut tidak tahu kapan atau oleh siapa mereka akan berikutnya difoto, dan memungkinkan mereka untuk berkonsentrasi pada peristiwa-peristiwa, yang menyebabkan hasil yang lebih baik," katanya. Sinar inframerah dapat melewati berbagai bahan, dan ketika mengambil foto dengan peralatan khusus yang menghalangi cahaya tampak, ada kasus di mana orang-orang kulit di bawah pakaian yang dapat diambil dalam film. Dalam beberapa tahun terakhir, telah terjadi peningkatan jumlah orang yang menggunakan cahaya inframerah untuk mengambil menyelinap melihat-melalui foto-foto atlet perempuan dan anak-anak di sekolah kegiatan olahraga. Kelompok olahraga dan pejabat sekolah telah menyuarakan keprihatinan mengenai fotografi tersebut. Beberapa produsen baju renang telah merilis produk-produk yang menghalangi sinar infra merah, tetapi ada juga telah menuntut pengenalan pakaian pelindung untuk olahraga lainnya. Cramer Jepang memperkenalkan produk-produknya setelah didekati oleh Inter-University Athletic Union dari Jepang mengenai masalah. Dibutuhkan waktu selama dua tahun mengembangkan pakaian dengan produsen tekstil Toyobo, dan Toyoshima, seorang pedagang grosir dan pedagang kain. Item pertama di garis jepang Cramer's "Ditembak Pengawal" produk adalah sepasang celana dalam. Dengan menghalangi sinar infra merah dengan pakaian dalam, atlet dapat memakai seragam sekolah dan peralatan olahraga di atas tanpa perlu khawatir menjadi diam-diam direkam. Perusahaan berencana untuk tetap meningkatkan materi dan ditetapkan untuk memperkenalkan produk-produk baru seperti bantalan payudara. "Dengan memperkenalkan kondisi yang membuat fotografi lebih sulit, jumlah fotografer jahat akan berkurang, dan kami berharap bahwa produk akan kami beberapa bantuan dalam fotografi seperti menghilangkan sama sekali," kata Hokazono. It is unfortunate to some and a blessing to others, that the technology that could see through skin would now be used to see skin, right through your swimsuit. Xray glasses on the back of magazines may not be so far from a reality these days as we see sites like XrayHunter.com form showcasing tons of girls Xrayed while enjoying themselves on public beaches. What you see here is a new form of “infrared photography” using the “near infrared” light spectrum. You may have heard about this controversial new technology on the news lately! View the ABC news clip here. 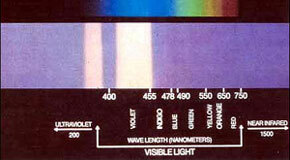 Waves in this spectrum are not visible to the naked eye but they are visible to the CCD chip in your camcorder. These “near infrared” light waves are the waves that are penetrating the material and reflecting an image of the body surface. The camcorder can pick up all these waves and records them. In order capture the x-ray effect you must block out the visible light waves or they will overtake your image drowning out the infrared image. Normally the nightshot or nightvision mode was to be used only at night when there is very very little white light or (visible light) as we know it. However there are no girls out on the beach at night so we had to trick the camera into thinking it was night. We do this by screwing a filter on the lens that only lets the “near infrared light” (750 nanometers or more) into the camera. All the visible light waves are blocked out (750 and below). If you were to hold this filter up to the sun you will not be able to see thru it. It is totally black! But when you screw it on the camcorder and look in the viewfinder you can see a perfect black and white image. This is the x-ray vision technology that you see in use here. In a bid to prevent people taking sneak see-though snapshots of female athletes using infrared photography, a sports equipment manufacturer here has developed underwear that blocks out infrared rays. The underwear was produced by Cramer Japan. The company’s president, Takashi Hokazono, said he hoped it would help athletes feel more at ease. “It will probably release them from the fear of not knowing when or by whom they will next be photographed, and allow them to concentrate on their events, leading to better results,” he said. Infrared rays can pass through many materials, and when taking photographs with special equipment that blocks out visible light, there are cases in which the skin underneath people’s clothing can be captured on film. In recent years, there has been an increase in the number of people using infrared light to take sneak see-through photographs of female athletes and children at school sports events. Sporting groups and school officials have raised concerns about such photography. Some swimsuit manufacturers have already released products that block out infrared rays, but there have also been calls for the introduction of protective clothing for other sports. Cramer Japan introduced its products after being approached by the Inter-University Athletic Union of Japan over the problem. It spent two years developing the clothing with textile manufacturer Toyobo, and Toyoshima, a wholesaler and trader of fabrics. The first item in the line of Cramer Japan’s “Shot Guard” products is a pair of underpants. By blocking out infrared rays with underwear, athletes can wear their uniforms and school sports gear on top without worrying about being secretly filmed. The company plans to keep improving the material and is set to introduce new products such as breast pads. “By introducing conditions that make photography more difficult, the number of malicious photographers will decrease, and we hope that our products will be of some help in eliminating such photography altogether,” Hokazono said. The underwear retails for 2,000 yen apiece.